A business profile often is the initial information a client or customer encounters about a particular company. A business profile should include the purpose, mission, history, and other important factors that define the nature of the company. The aim of business profile form is to influence the purchaser’s decision by demonstrating your credibility and convincing potential customers. 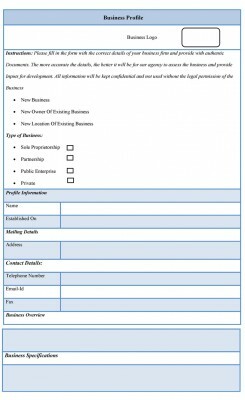 A business profile form contains information like trading name, company logo, what the business supplies, contact details, financial viability of the company, capabilities and capacities, trading history, insurance details, corporate governance, quality management, layout and production, distribution etc. Included in a business profile is an overview of goods or services provided by the company. It also includes information about its performance and reputation as well as its organizational structure. A business profile should be reviewed at least once every six months or anytime a major development occurs, impacting the company and its operations. A business profile form should be concise and to the point. 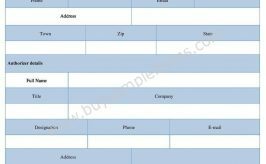 The business profile form should be prepared very efficiently including all requirements significantly. 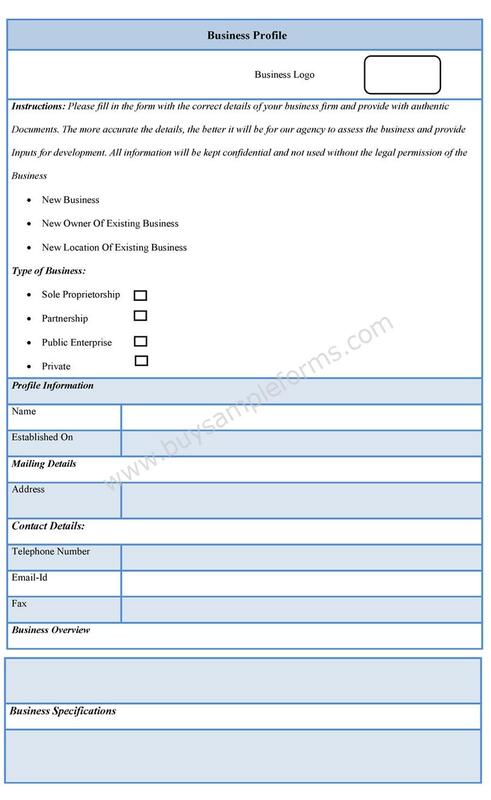 The sample Business Profile template is available online in both MS Word and PDF format. Both MS Word and PDF format allows you to edit and customize according to your requirement. Just download the forms and fill out appropriate information fields. An estimate for an electrical job is a contract between electricians and client. Locksmith services range from simple lock out jobs to large construction projects. Business Sale Agreement forms refers specifically to the contract between the seller and purchaser for the transfer of either shares or assets of a going concern business. Business Proposal forms are essential for any business regardless of the size of the business. The four main types of financial statement are statement of financial position, income statement, cash flow statement, statement of changes in equity. In order to assess the tax liability of your business with respect to different taxes, as well as to report and pay the taxes. Business Financial Statements are written records of a business financial situation. These financial statements are a useful tool in analyzing your company’s financial position and performance. Painters business estimate form is important for the clients as they are likely to ask for an estimate of the project cost. Lawn service business involves maintaining lawns and/ or shrubbery for the owners on a regular basis. A business contract is a legally binding agreement between two or more parties. A business sale contract contains details such as price, terms of payment, price allocation, form of the transaction, liabilities, and warrants. The business sale application form is a document used by companies during recruitment of new sales employees for the business. Business report forms are used by business managers to know about a company’s annual report. Business report contains statistics and specific information. A business property lease form creates a commercial tenancy agreement between a landlord and a tenant. Business letter is the tool to communicate with employees, customers, and stakeholders. The structure and organization of any business letter form is important. Business lease agreement is a legal contract between a property owner or manager and an individual or business entity for the occupation of office, industrial, or retail related space.